Since the mid 1970s six spacecraft (Viking 1 & 2, Sojourner, Opportunity, Spirit and Phoenix) have successfully landed on the surface of Mars. In probably the most audacious, breathtaking and risky space missions, in less than two days, another Mars Curiosity Rover will arrive on Mars. Using a technique never used before, NASA has described the Entry Decent Landing as the seven minutes of terror. Launched in November 2011, the arrival of Mars Curiosity will for the first time make a high precision landing which is so crucial to its primary scientific goal of finding evidence of earlier Martian environment that may have been suitable for life. Also known as the Mars Science Laboratory (MSL) it will be supported by a pair of NASA satellites (Odyssey and Mars Reconnaissance Orbiter (MRO) already in Martian orbit. Mars has never been under so much human scrutiny. In addition to the still functioning Opportunity, a rover on the surface of Mars (launched in 2004) and the two NASA satellites, there is also the European Space Agency’s Mars Express is also in Martian orbit. 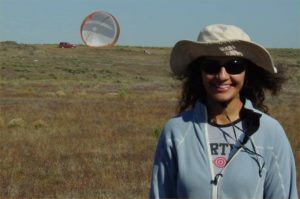 Dr Anita Sengupta is a member of the Entry Decent Landing and Advanced Technologies group at Jet Propulsion Laboratory. In this interview recorded on August 2nd via telephone from her office in JPL she captures the sheer exhilaration of the dramatic entry decent and landing phase and describes her role in the Mars Curiosity rover mission.